I inherited my ‘toy’ gene from Pa.
One of the key differences between us, though, is that Pa also has the ‘caution’ gene whereas I have a much higher whim factor. You’d not find Pa taking on any old condition without having properly researched it in What Neurological Disease Magazine and carefully reading the most recent reviews in Which. Whereas me… anything for a laugh, poop poop. Now, somewhere at the back of Pa’s toy cupboard, probably wedged between a demi-john, a pantomime dame costume and a table‑tennis bat, will be his old cine-camera. Fortunately, his film-making phase was followed in later life by a ‘transferring to dvd’ phase. So we can still, should we want to, relive the thrill of seeing LittleBro regurgitating a green pancake, as Pa experimented with the special effects on his cine-camera. And yesterday, as ActorLaddie and I set out to explore the area around our Rome apartment, I was reminded of the film Pa took of our first family holiday abroad. That’s not the time that Pa took us all to Wales, having bought a full set of camping gear from Exchange and Mart. We sat and watched rain for two days, came home and flogged the tent to some other poor sucker. No, our first proper holiday abroad was a package deal to Majorca, exotic in the early seventies. It was not a wild success. Up to that point, family holidays had consisted of rather jolly chalets in Norfolk or the Isle of Wight. Now Ma and Pa had to cope with persuading three fussy children to eat unfamiliar foreign foods: pizza, pasta and the like. And we were hot, hot, hot. I am not naturally a hot weather person. For one thing, I have pale skin: like Woody Allen, I don’t tan, I stroke. I’d rather be curled up reading in front of a log fire than on a sunbed. Heat made me grumpy. I was also at the time in the throes of full-blown adolescence which must have added to the joys of the occasion. For the last scene in the film of our holiday, Pa had us walking down the beach away from the camera, as the credits rolled. On the film, you can see LittleBro and LittleSis skipping along in beachwear, enjoying sand and sea. I skulk behind wearing, would you believe, black trousers and an orange polo-neck jumper, though as a concession to the heat, it is sleeveless. So, up until last year I would have defined myself as someone who didn’t holiday in hot places. But last summer, my mind was changed. A couple of months after my diagnosis, we went to Florence. It had been booked well before Parkinson’s was even a possibility and, in the fall-out, we came very close to cancelling. But it was wonderful: the best holiday of my life, so far. The heat made it impossible to rush around – I had to slow down; rest, read and relax. The effects of heat on my aching shoulder and neck were miraculous. 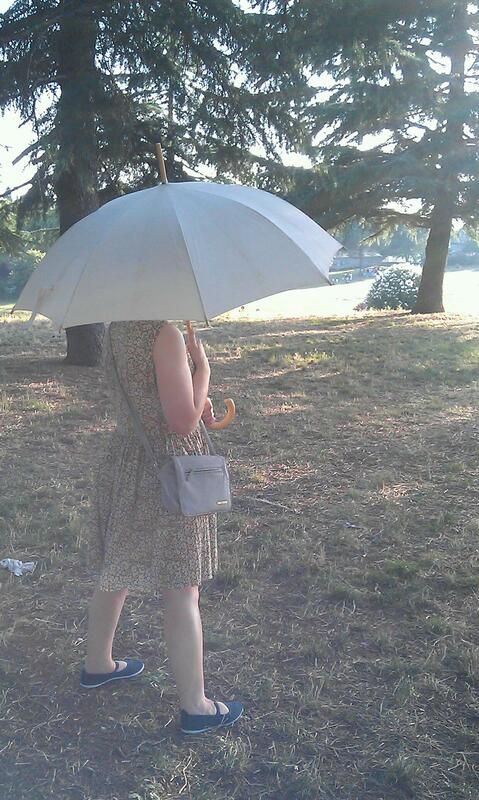 And, without the vanity of youth, I developed an ‘Englishwoman Abroad’ look which works for me. So this year, we are braving Rome. It is hot, hot, hot. 36 degrees today. And we are lounging and reading and resting, as well as popping out in the mornings and evenings to do the odd Coliseum or two. My aches have already melted in the heat and if it wasn’t for the tablets, I’d probably forget about the Parkinson’s altogether. In any case, I’m getting bored with it. I was considering taking up the ‘cello instead. I’ve always loved the sound of a ‘cello. Can’t sew for toffee, though! Also, I’ve not coped with having YouKnowWhat whilst bringing up young children, which is pretty darn marvellous! Don’t do the ‘cello thing though! My mate Louise plays one and it takes over your whole life! Maybe you should try something unusual, like the concerti… oh, okay. The descant reco… oh. Uhm, the flu… damn. Did Italy three years after diagnosis. It was a great vacation. Also, had same feeling that I needed less medication. I hope you have a great time in Rome! Thanks. I love your photo from St Peter’s. Will look out for it.